I've written several pasta recipes in the past and none of them included a unique combination of ingredients present in this variation. This one is quite unique and gives you completely different taste and aroma than a typical pasta recipe. Inclusion of mint and peas gives it a pungent texture topped with flavorful richness of goat cheese. This pasta must be consumed fresh when it's piping hot. You may also combine two different cheese varieties to get a completely different taste. I've used Penne pasta, but you can also use any flat ribbon type pasta variant. So without any more delay, let's get on to the work and prepare this yummy and easy-to-make pasta recipe for our friends and family members. 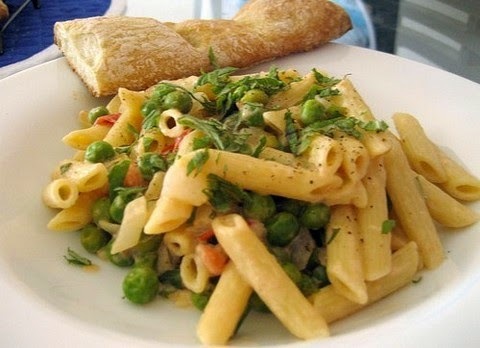 Make this irresistible platter of Penne pasta which includes flavorsome and fresh goat cheese with delicious green peas to give you a tasty preparation. Boil pasta in a bowl for about 5 minutes and drain the water. Add carrots & tomatoes and saute for about 2 minutes. Add pasta and stir well for a minute. Add mayonnaise, peas and carrots. Lower the flame and add 1/4 cup of water and let it simmer. Add fresh mint leaves, goat cheese and pepper powder. Stir well for half a minute and serve hot.